Linked to the rest of the archipelago and across the world through a modern international airport, Cebu makes for the perfect gateway to Philippines. One can find a great mix of metropolitan areas steeped in history, quick nature escapes (as beaches and mountains are never too far away) and, of course, lip-smacking food. Before you scoot off elsewhere, this booming paradise most definitely has lots to offer. While things come and go in this progressive province, I’ve listed down the classic must-dos when you come to visit. A self-guided historical tour makes for an eye-opening introduction to the first olonial settlement in the Philippines. Start your tour at Magellan Shrine on Mactan island, not far away from the Mactan-Cebu International Airport. Here, Portuguese explorer Ferdinand Magellan, leading a Spanish expedition that eventually circumnavigated the Earth from 1519 to 1522, perished at the hands of local warriors under the command of Lapu-Lapu, a chieftain whose bronze statue stands proudly nearby. Magellan’s death delayed the eventual conquest of the archipelago by the Spanish crown over the next three centuries. Founding legacies of colonial rule endure in downtown Cebu City, where stone-and-mortar edifices still stand like Fort San Pedro, Magellan’s Cross and Basilica Minore del Santo Niño, a major pilgrimage site housing a venerated 16th-century image of the child Jesus — the country’s oldest surviving Christian relic. Those are the most important sites, but if you have more time, there’s also the Cebu Metropolitan Cathedral, Museo Sugbo (the provincial museum housed in a 19th century prison complex) and Spanish-era heritage museum houses like Casa Gorordo, Yap-San Diego House and Jesuit House Museum (the country’s oldest dated house, built in 1730). No less than celebrity chef Anthony Bourdain has declared lechon de Cebu “the best pig ever”! A Spanish-influenced favourite traditionally served during fiestas and other special occasions, Cebu-style roasted pig indulges your senses with its crispy brown skin, juicy flesh, and mouthwatering aroma of leeks, garlic and lemongrass. While popular restaurants like Rico’s Lechon and House of Lechon serve the city’s best, they’re no match for the lechon stalls of Carcar Public Market, 40 km away from Cebu City, where you can sample fresh, home-cooked pigs before feasting with a heap of pusô, a Visayan street food staple of rice cooked in woven coconut leaves. Before leaving town, don’t forget to bag another delectable specialty: crunchy pork rind cracklings called chicharon. Classical guitars are as synonymous with the province as lechon and dried mangoes. The tradition of guitar-making here started in the 19th century, when Spanish missionaries commissioned local woodworkers to repair their instruments instead of sending them back to Mexico. Presently, the cottage industry centers along the Pajac-Maribago Road in Lapu-Lapu City on Mactan island, where guitar workshops and showrooms like New Susing’s Guitar have set up shop since after World War II. Besides the iconic stringed instrument, local luthiers also manufacture bandurrias – mandolin-like guitars – ukuleles and curious-looking cocoleles, which are ukuleles fashioned out of coconut shells, among others. Drop by to shop for quality instruments, or admire how they’re tediously crafted by hand at the workshops. You’re never far from the sea when traveling along the slender-shaped province, its endless coastline and offshore islands punctuated by stretches of white sand perfect for sunbathing, swimming, and snorkelling. Bluewater Resorts has luxurious getaways on the urbanised island of Mactan and, farther south, on Sumilon island, off the coast of Oslob town, a sumptuous 24-hectare retreat with seaside cabanas, massage huts and infinity pools. For a low-key rustic escape, discover the tranquil shores and cave pools of Bantayan or Camotes islands, staying at Kota Beach Resort or Mangodlong Paradise Beach Resort, respectively. The province’s southwestern towns boasts of beautiful waterfalls from Barili to Samboan. Jump into the natural pools of Kawasan Falls surrounded by the jungles of Badian, 120 km from Cebu City, one of several lovely cascades in the southern end of the island. The waterfalls in the locality exhibit an iridescent turquoise hue, caused by limestone minerals dissolved in the water. For a thrilling adventure, book a canyoneering tour with Kawasan Canyoneering. The five-hour excursion involves river trekking down the Kanlaob river, swimming through narrow gorges, sliding down rock walls and leaping off waterfalls! More scenic cascades can be discovered in towns of Barili, Alegria and Samboan like Mantayupan Falls (the tallest in the province), Cambais Falls and Aguinid Falls, to name a few. Cebu has long boasted some of the best scuba diving in the country. After all, it’s a one of the pioneering diving destinations in the Philippines. A shallow plunge along Panagsama Beach in Moalboal, 100 km south of Cebu City, with Quo Vadis Dive Resort – my favorite place to stay in town – reveals mesmerizing encounters with green sea turtles and massive swirling schools of the sardine run, while, offshore, the barren islet of Pescador has coral-laden walls exploding with marine life such as moray eels, frogfishes and leafy seadragons. Off the northern tip of Cebu is Malapascua island, the only place where you can dive with rare thresher sharks everyday. Several dive operators organize sunrise dives at Monad Shoal, a cleaning station where these deep-sea sharks with whiplike tails congregate every morning. Want to level-up from those views of Metro Cebu from the popular Tops Lookout? Cap off your sojourn with a hike up the island’s highest point, Osmeña Peak in Dalaguete, 100 km from Cebu City. Lording over the cool-weathered vegetable valleys of Mantalongon village, the foggy mountain is a collection of karst outcrops with the highest one rising 1,013 meters above sea level. Don’t be intimidated at all, as you can reach the viewpoint on foot in only 15 minutes, where you can marvel at the craggy crown with a backdrop of Negros island across Tañon Strait – a panorama best enjoyed during sunset. A more challenging, newly discovered hiking destination is nearby Casino Peak, a former gambling hideout an hour’s walk farther, which has views of the Mantalongon range that rival Osmeña – minus the selfie-snapping crowds, especially on weekends and holidays. Have you done any of these activities? Which was your favorite? Share your Cebu experiences in the comments section below! Looking for a place to stay in Cebu? Find discounted rooms for hotels and resorts. 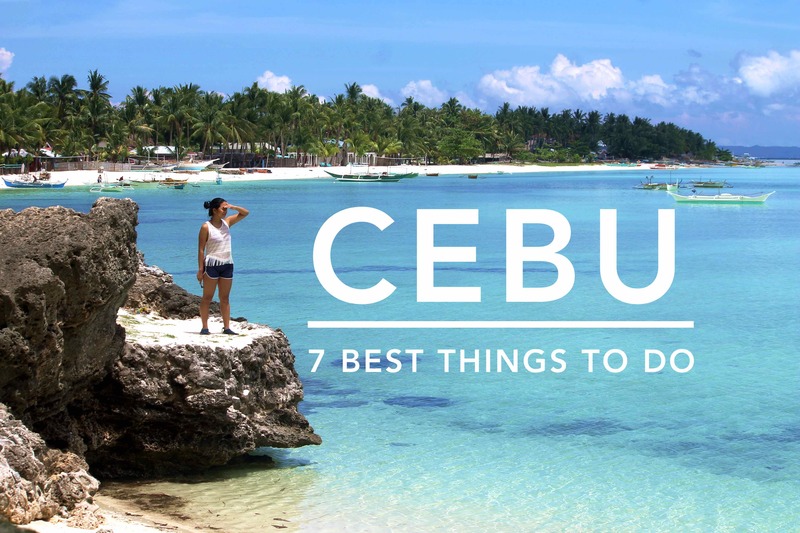 Hi Ed, thanks for this guide… this will come in handy when I visit Cebu in August this year. By the way, for Kawasan adventure, is it okay to bring a dslr camera if I take a full canyoneering activity? You’re welcome, Roy! Glad to hear this post proved useful. Yes, it’s possible to bring your DSLR. I suggest you secure it in two layers of dry bags – preferably your own just to be extra safe. You may ask the guide to take care of it for you during tricky portions of the canyoneering activity. Enjoy your trip to Cebu!